Loropetalum chinense or Chinese fringe flower as it is commonly known, is a small to medium shrub originally from China. Generally a rounded shrub to 2m with arching branches. Grown for the foliage as well as the attractive flowers these are a versatile garden plant. Used as filler plants in the garden border, as well as grown as low hedges. The colourful foliage and flowers act as a foil for garden furnitire and they look great when planted at the base of a wall or fence. Excellent in a rock garden and the more compact varieties will grow well in containers. Look for Loropetalum chinense the white flowering variety as well as Loropetalum chinense var. rubrum a pink flowering variety. L. chinense ‘China Pink’ and L. chinense, ‘Plum Delight’ and ‘Plum Gorgeous’ are three named cultivars. Plant in a humus rich moist but well drained soil in full sun to part shade. 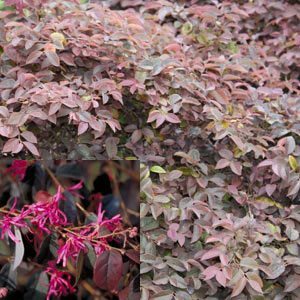 Pruning Once established Loropetalum chinense are a hardy plant and require little care other than a n annual light trim to keep in shape. With either white or pink flowers this evergreen shrub is a graceful and useful garden plant.